Our alarm was set for 5am this morning. It was still dark outside and very very cold! As arranged with the hostel owner, we met him downstairs and jumped into his car for a lift to the bus station! This was free of charge too! Bonus! We got to the border pretty sharpish and it was now daylight. As we drove towards the border, you could see that the ploughs have been and pushed the snow to the side creating 2 metre high snow walls to guide the path of the road. I couldn’t believe how much snow there was. We also had an amazing view of a volcano at the border. To be honest, this was probably the most beautiful border crossing we’ve had yet! When we got to the border, we easily got our stamps with the usual funny looks at me as though they don’t believe that I’m British because of my Chinese face. Then it was back on the bus towards Pucón. In a few hours we arrived and managed to check into a hostel where we stayed in a nice little shared cabin. Although we had booked for a shared room, the lady (who spoke no english) let us stay in the private double room with our own ensuite! Luxury! We popped out and walked around the little town before picking some food up from the supermarket. 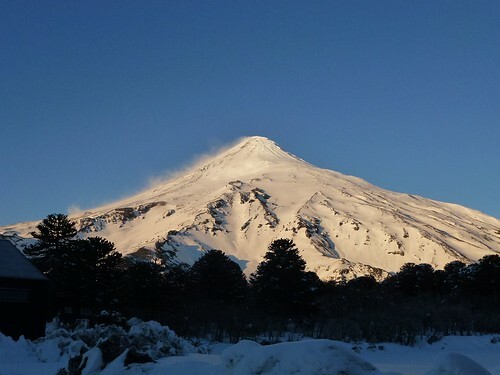 When we got back to our cabin we bumped into the Kiwi couple who we met in El Bolson so we had a quick catch up with them but they were suffering as they had climbed up Volcan Villarica yesterday – this is something that we are looking to do. Maybe the day after tomorrow! This entry was posted in Argentina, Border crossing, Chile and tagged border crossing, bus, volcano. Bookmark the permalink.